The NATO alliance commits each member to come to the collective defense of a member if it is attacked. During the confrontation with Russia over Ukraine last year, a majority of Americans (56%) were willing to fulfill this security commitment if Russia got into a serious military conflict with a NATO ally. But that finding masked a partisan divide: Nearly seven-in-ten Republicans (69%), but only 47% of Democrats, supported using force to aid a NATO ally attacked by Russia. Last year’s survey found that the U.S. and Canada were the only countries in which more than half of respondents backed using military force if Russia got into a serious conflict with a NATO ally. At least half of Germans, French and Italians said their countries should not use military force to defend a NATO ally if attacked by Russia. When it came specifically to aiding Ukraine, half or fewer in every NATO country surveyed supported the idea of the alliance sending arms to the Ukrainians. 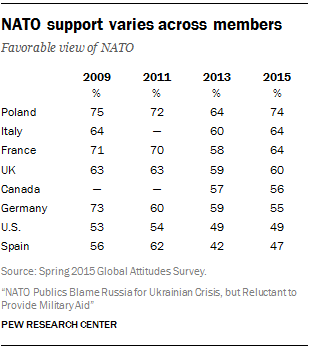 However, a median of 68% of people in NATO countries surveyed believed the U.S. would defend allies in such circumstances. In his Washington Post interview, Trump singled out Germany in particular for criticism about not carrying its weight. 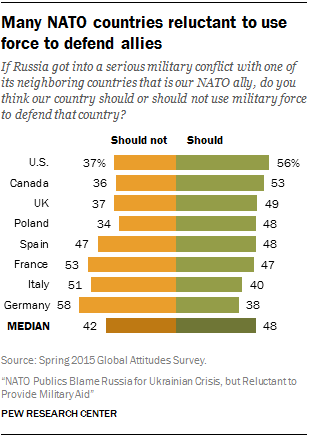 Most Americans agree that Germany should boost its military contribution in the world. More than half (54%) think Berlin should play a more active military role in maintaining peace and stability in the world, while only 37% say it should limit its role. Democrats (60%) more than Republicans (51%) back a more active German military. Notably, given their country’s history, 69% of Germans want to limit their military’s role in world affairs.